In Q2, the United States was number one for hosting malicious domains and exploit kits. Unit 42 regularly analyzes statistical data from our Email Link Analysis (ELINK) to understand the patterns and trends in current web threats. This blog outlines our analysis for April – June (Q2) 2018 and follows up our previous blog analyzing web-based threats for January – March (Q1) 2018 that can be found here. We also provide detailed analysis of attacks against CVE-2018-8174 (a vulnerability we discuss below) using the Double Kill exploit. What we found this quarter was that vulnerabilities under attack remained consistent, including very old vulnerabilities. One new vulnerability used zero-day attacks did rocket to near the top of the list. The United States remained the number one hoster of malicious domains, with a marked increase in the Netherlands as well. Outside of these two countries hosted malicious domains dropped markedly across the globe, including in Russia and China. 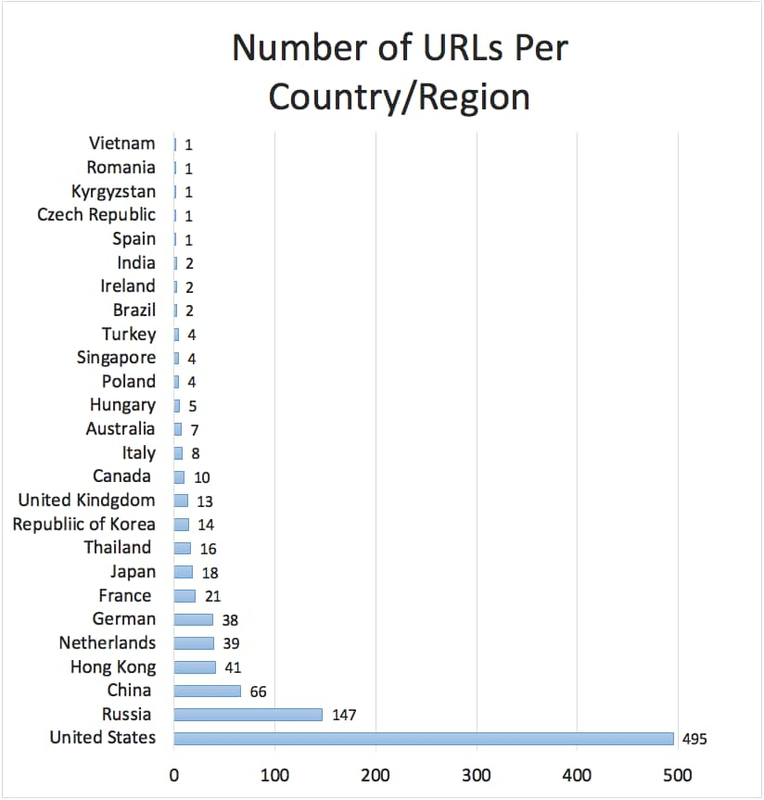 The United States was also the number one hoster for exploit kit (EKs) globally by a more than two to one margin compared with the number two country, Russia. In fact, the United States alone accounted for more EKs globally than all other countries combined. KaiXin, Sundown, and Rig exploit kits remained active from Q1 to Q2. We saw a significant difference in regional prevalence with KaiXin being found primarily in China, Hong Kong, Korea and Grandsoft (a newly emergent EK), Sundown and Rig prevalent everywhere else. Based on our findings, our guidance is for organizations to focus on ensuring Microsoft Windows and Adobe Flash and Reader are fully up to date with the latest versions and security updates. In addition, organizations should look at using limited privilege user accounts to limit the damage of malware. Finally, protections against malicious URLs and domains and using endpoint security to prevent malware like exploit kits can all help with the threats outlined in this posting. The United States remains the number one country for hosting malicious domains. Overall, except for the Netherlands, the number of malicious domains hosted outside of the United States was significantly smaller than we saw in Q1. We saw a significant increase in malicious domains hosted in the Netherlands. We saw significant decreases in malicious domains hosted in Russia and China dropping both to be tied at number 7 on our list. While we saw a significant decrease in malicious domains hosted in Hong Kong, it remained the third largest hoster of malicious domains. Australia moved to number four on the list, but the increase wasn’t significant. The number of malicious domains hosted in Germany dropped by over half. The number of malicious hosted domains in the United Kingdom and Italy was unchanged. However due to the overall decline outside of the United States and the Netherlands, they actually moved from being tied at number 3 to number 6. A new vulnerability is aggressively used. CVE-2018-8174, a Microsoft VBScript vulnerability that was used in zero-day attacks and patched in May has been aggressively used in web-based attacks this quarter. Very old vulnerabilities are still useful. CVE-2009-0075, a nine-and-a-half-year-old vulnerability Microsoft Internet Explorer 7 vulnerability was in our top five list last quarter and is number four this quarter. CVE-2008-4844, another nine-and-a half vulnerability affecting Microsoft Internet Explorer 5, 6 and 7 is number five this quarter. Vulnerabilities under attack remain consistent. The United States was the number one source for Grandsoft, Sundown, and Rig and the number two source for KaiXin making it the number one source for Exploit Kits globally. In fact, the US accounted for more than twice the number of Exploit Kits globally as the number two, Russia. Russia was number two globally for Grandsoft, Sundown and Rig exclusively. 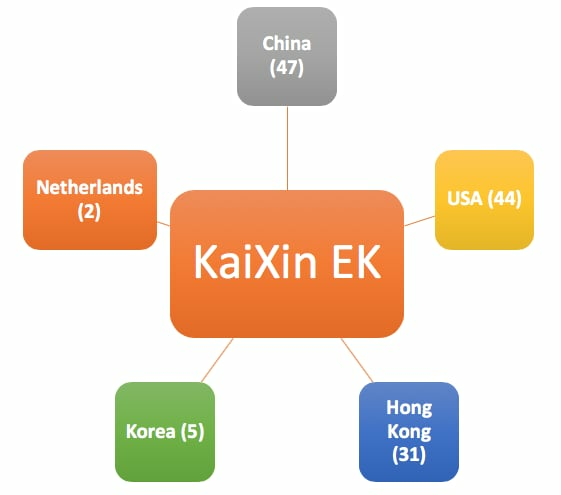 KaiXin showed up primarily in China, Hong Kong, and Korea, with limited distribution in the United States and Netherlands. Consistent with other findings in this report, the Netherlands came in at number 5 on our list, primarily for Grandsoft, Sundown and Rig but also KaiXin. Australia came in at number 6 on our list. Interestingly, even though KaiXin was prevalent in the APAC region, there were no instances of KaiXin in Australia only Grandsoft, Sundown and Rig. KaiXin, Sundown, and Rig were consistently in use across Q1 and Q2. Sinowal which we tracked in Q1 disappeared this quarter. Grandsoft is a new entry this quarter. In the second quarter of 2018 we observed 6 different CVEs being exploited. Table 1 below shows the top three CVEs for the first and second quarters of 2018. 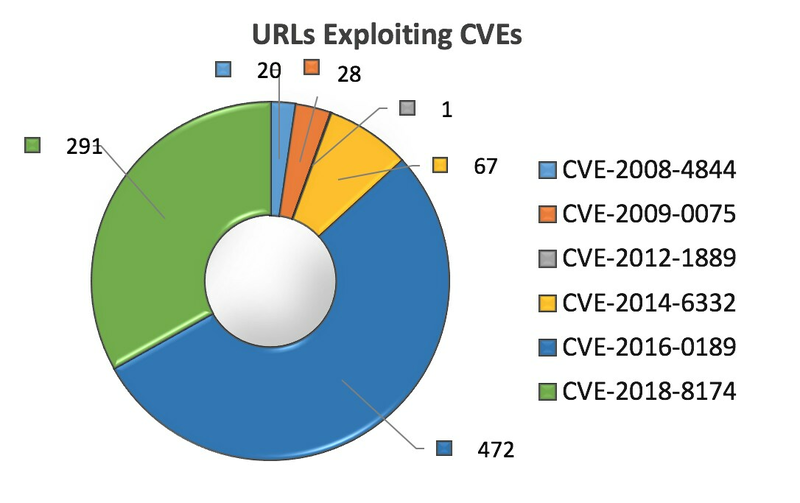 The chart below shows the CVEs and number of URLs seen leveraging the respective CVEs. Compared to the data observed from the first quarter of this year, the URL count exploiting certain CVEs have changed positions in ranking. CVE-2014-6332, a four year old code execution vulnerability in Microsoft OLE automation fixed by MS14-064, dropped significantly from first place with 774 malicious URLs, to third place with 67 malicious URLs. In the second quarter. CVE-2015-5122, a three year old code execution vulnerability in Adobe reader fixed with an emergency release by APSA15-04 and later by APSB15-18, was number three last quarter but dropped off the top six list entirely this quarter. CVE-2016-0189, a two year old scripting engine vulnerability affecting Microsoft Internet Explorer, as well as Jscript and VBScript and fixed by MS16-051 and MS16-053 respectively, moved by number one by more than doubling its previous standing from 219 malicious URLs in the first quarter to 472 malicious URLs in the second quarter. Of particular note is CVE-2018-8174 a code execution vulnerability in the Microsoft VBScript engine that was detected as a zero-day attack and patched by Microsoft in May 2018. This vulnerability wasn’t publicly known until the second quarter and we can see was quickly used by attackers taking advantage of it, making it number two on our list in the second quarter, exploited by 291 malicious URLs. To shed more light on this CVE we investigated an active exploit dubbed Double Kill which we will discuss in the case study section of this blog below. Finally, we should note again the presence of CVE-2009-0075, a vulnerability from February 2009 in Microsoft Internet Explorer 7 fixed with MS09-002 and CVE-2008-4844 a vulnerability in Microsoft Internet Explorer 5, 6 and 7 fixed with MS08-078. These two roughly nine-and-a-half-year-old vulnerabilities continue to be useful for attackers, as shown by them being number five and six list last quarter and number four and five on our list, respectively, this quarter. The net lessons from this quarter’s statistics are the very old and very new vulnerabilities show themselves to be useful. There’s also a steadiness to the vulnerabilities attackers are favoring since four of the top five vulnerabilities this quarter were in use last quarter. The fact that number two on our list is new vulnerability only addressed in May and was used in zero-day attacks also tells us that attackers are ready to move quickly to adapt their attacks to vulnerabilities shown to be useful. The continued use of these two nine-and-a-half-year-old Internet Explorer vulnerabilities also tells us that Internet Explorer 7 and earlier are in use and unpatched. There were 1072 malicious URLs out of the total 1373 serving EKs. As with malicious domains, we were unable to discover hosting information for some of the domains as they were gone prior to starting research on this blog, which is why Figure 3 adds up to less than 1373. The EKs we found in our analysis for this quarter included KaiXin, Grandsoft, Sundown, and Rig. Three of these EKs were in our Q1 report: KaiXin, Sundown, and Rig. One EK in our Q1 report, Sinowal, has dropped out of our list. And Grandsoft was not present in our list in Q1 and is now in our list. The various EKs seem to target a certain country or region cluster. For instance, KaiXin EK was only reported in 5 country/regions (see Figure 4 below), mostly within Asia. 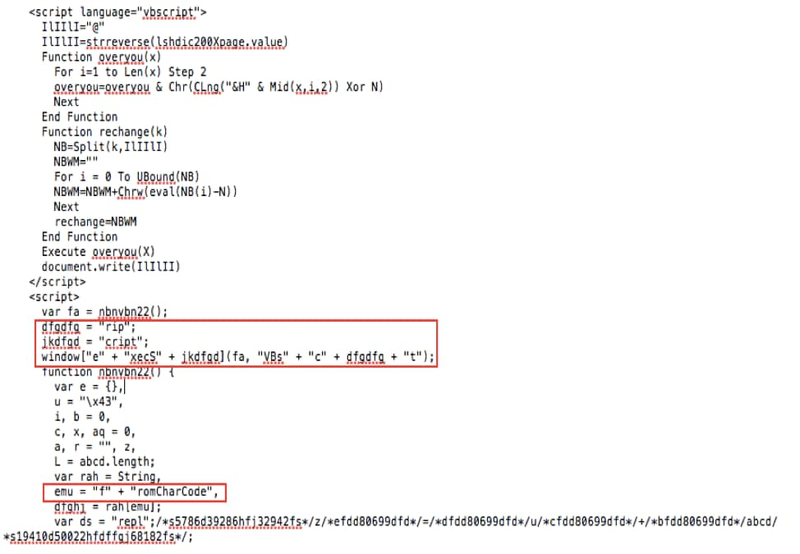 This EK mostly leverages the vulnerability CVE-2014-6332. 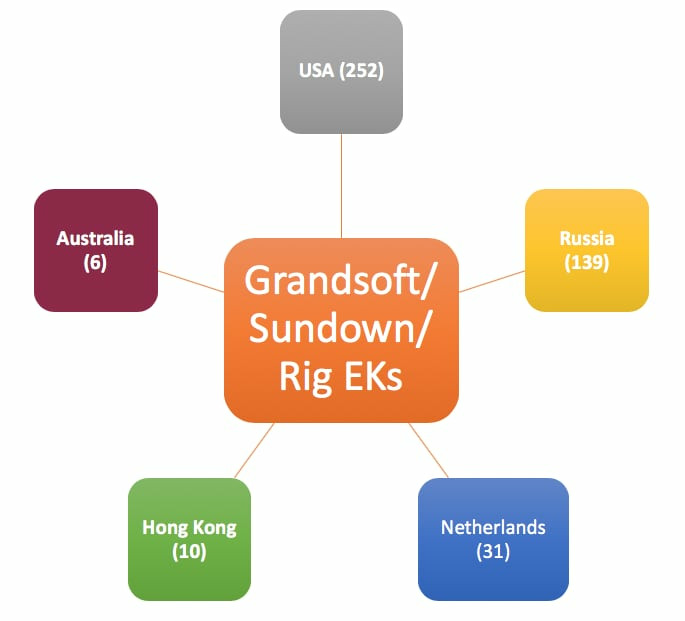 The Grandsoft, Sundown, and Rig EKs were far more visible in other parts of the world. Out of the 16 country/region where they were seen, the United States had the highest number of malicious links EKs, at 252. Second and third place were Russia with 139, and the Netherlands with 31. These EKs mostly exploit CVE-2016-0189. Figure 5 below shows each country/region and associated numbers. As noted in the previous CVE section, on May 8, Microsoft published information and a patch for CVE-2018-8174, a Windows VBScript Engine Remote Code Execution Vulnerability. It’s a critical vulnerability that impacts 31 Microsoft products and could lead to remote code execution. A couple of notable exploits of this CVE that we’ve observed are discussed in the below case studies. Unit 42 found the first active exploit in the wild on May 12, four days after a patch was issued. It is interesting to point out that it took four days for threat actors to create and weaponize the exploit after Microsoft’s disclosure of the vulnerability. Below are some malicious behaviors we captured from this first version of the exploit. These malicious behaviors show the exploit downloaded a document file to the Windows temp directory, deleted some registry entries to make sure there is no entry to be restored when opening Word next time. In the second exploit, attackers used several types of obfuscation to hide the exploit. For example, the textarea HTML tag with display attribute “none” was used to hide the real exploit code. The obfuscated string in textarea started with “>tpircs and ended with “>tpircs<” will not be showed in html page, but it can be deobfuscated to a meaningful string as a part of exploit, for example “tpircs” will be decrypted to “script” tag as shown below in Figure 7. In the VB part, obfuscation was not as widely used. Keyword separation using string concatenation and substitution was used instead to evade detection. 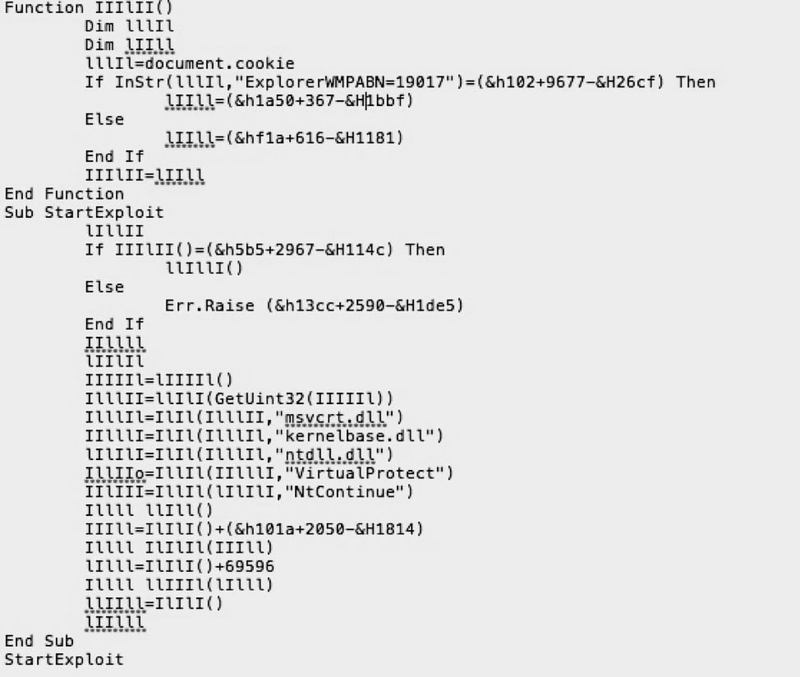 For example, in Figure 9 below we’ve pointed out where “vbscript” and “fromCharCode” were manipulated. This attack exploits the same vulnerability (CVE-2018-8174) as Double Kill but uses a different method to deliver the payload. It uses PowerShell to download and execute files as shown below in Figure 10. This attack campaign was clearly planned in advance. The malicious domain, ‘payert-gov[. ]uk’, was registered around 10:30 AM June 26. The attack started around 10:30 AM June 28. After around one hour, the domain became unresponsive. The domain registration shows that the attacker likely used public information details from an employee of a legitimate financial institution (which was not targeted in this attack). In total, we captured 699 malicious emails within this attack. All the malicious emails with malicious links we captured were sent from the spoofed “no-reply@hmrcmailgov.uk” email with the subject field containing: “Important : Outstanding Amount”. All malicious URLs used the C2 domain ‘payert-gov[.]uk’. You can see an example of the emails at My Online Security. Looking at this quarter’s trends, we see a surprising drop in malicious sites globally, particularly in Russia and China. Meanwhile, the United States remained the top hosting country for malicious sites and exploit kits. Another surprise this quarter is the sudden, unexpected spike in the Netherlands, both in terms of malicious sites and exploit kits. In the realm of vulnerabilities, we see remarkable consistency, with a nearly identical roster of vulnerabilities under attack in this quarter as last quarter. The only notable addition to this roster is a vulnerability known to be used in zero-day attacks. We also saw a clear geographic division in the use of exploit kits, with KaiXan favored in East Asia while Grandsoft, Sundown, and Rig were used more in Europe and the United States. Next quarter, we’ll return to review this quarter’s statics and trends against the latest data from ELINK to help you better understand the threat trends that are out there.